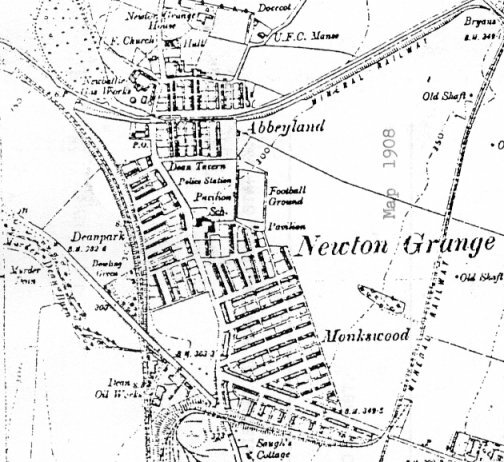 When Newtongrange Star were formed as a juvenile team in 1890 they played on ground on the left of Lovers Lane. The ground was named Victoria Park. There was no pavilion so teams changed at the Dean Tavern. Any player unfortunate to be injured and unable to continue were looked after in 13 Dean Park, the home of Jean Taylor, whose home was directly opposite the Dean. There they had the comfort of a roaring fire, and were sustained by mugs of hot tea until such times as the Dean reopened. The Star's first pitch was part of what is now the public park. The pitch was situated on a piece of ground which is now the swing park. The pavilion was along the wall at St Davids. Allans Kirk near the park entrance at St Davids. Right side of gate coming in from that entrance. 'For some years the members of Newtongrange Star Football Club have felt seriously inconvenienced for the want of a proper clubhouse and dressing accommodation. 'Some time ago a movement was set afoot with a view to having a pavilion erected on the ground. Subscriptions were invited, and heartily given, with the result that on Saturday last, a substantial and commodious clubhouse was formally opened. The new building will undoubtedly be a great boon to the club members. It is a handsome brick structure with a corrugated iron roof, and consists of one large apartment, divided by a curtain, and what will probably be most appreciated, a large well equipped bathroom. The Dean Committee paid for a six foot high brick wall around the public park in 1904 and agreed to a seven foot high wall being built around Victoria Park. In fact, only two sides of the wall round the pitch were built at first, owing to a shortage of bricks. The massive housebuilding programme in the village at this time was the top priority. Between the park and the football pitch ran a path connecting Abbeyland and Monkswood and this got the name Lover's Lane as the high walls created seclusion. Before building the wall the wooden cricket pavilion had to be temporarily removed but in the move it was damaged so the Dean built a new brick pavilion for the cricketers and laid a new pitch for them. Newtongrange Star F.C. had played no matches during the First World War and their pitch and pavilion were badly neglected. They applied to the Dean Committee in 1919 for a grant to help re-start the club. The pavilion needed rebuilding and the gates and fences were broken down. The War Memorial Committee proposed that the old pitch be used as part of an extension to the public park and the Dean Committee decided to provide a new pitch and pavilion for the Star beside the bowling green at Murderdean Road.